So many of our diversions, the ones that form habits are to escape reality. 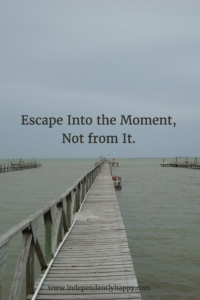 We should practice presence and living in the moment instead of trying to escape the moment. Confusing ease and comfort for happiness, we avoid difficult and uncomfortable. 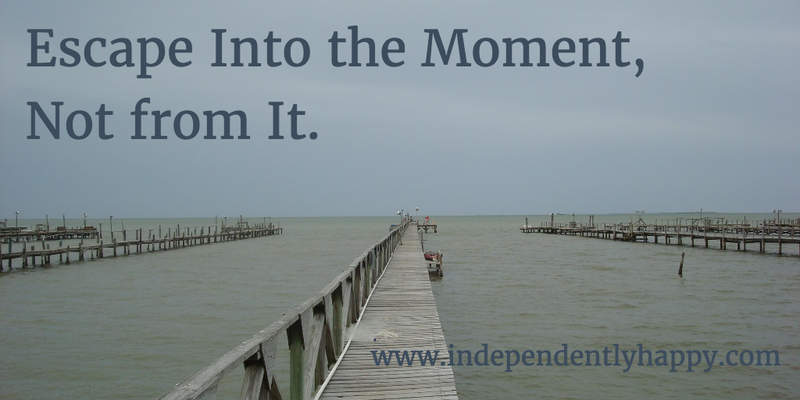 A more productive way to grow and become independently happy is learning to escape into the moment, not from the moment. A good way to determine if we’re escaping into or from the moment is whether or not the task requires grit or Resilience. Exercise, nutrition, meditation and learning require persistence to stick with them and do them consistently. It takes a little grit to do them consistently, to do them when we don’t want to, to find the time when we don’t think you have it. Yet the doing it when we don’t want to or feel like we have time to do them builds grit. Click to get three habits that will boost your happiness! Exercise requires some–and builds some–grit and resolve. Consistent exercise makes us stronger and more resilient. If we have a chocolate bar when we think we need one, that doesn’t help us with our resolve, grit or resilience. In fact giving in only makes it easier to give in again. Seeking a healthy alternative the chocolate bar (or cigarette) we think we need takes some grit and resolve, but it builds resilience. Some things like laughter and music are easier but beneficial. Usually, though, the hard way is the happy way. In addition to the physiological benefits of good sleep, exercise, and nutrition, we also develop the mental benefits of grit and resilience. The progress is compounded physically and mentally. The pleasurable and diverting ways are tempting because the offer escapes from the uncomfortable. But they often involve us doing things that aren’t healthy in the long term. They’re also usually a method of procrastinating, escape from something we really need to do. This is why meditation is hard. It’s not comfortable and blissful for us like it is for Instagram and Pinterest models. Our minds wander. We get fidgety. We’ve got too much to do! How the heck can we just sit for an hour when we’ve got so much to do. It’s just a practice though. It’s not emptying the mind, but practicing control of our thoughts. It’s practice at taking our thoughts where we consciously want them to go. Wanna boost your happiness? Click here for the script! Then Have Some Fun Too! I’m not suggesting that we can never enjoy those diversions. I love having beers with my friends. My wife bakes some mean cookies and cakes, and oh man our Saturday morning homemade biscuits are delicious! And although I’m currently behind on Luke Cage and Iron Fist, I love the Marvel shows on Netflix. Let’s continue to enjoy those things after we contribute to our Happiness Accounts. What’s your favorite–or most tempting–diversion? Mine is chocolate. After a rough day at the office, I really need some chocolate. What’s yours? Tell us in the comments below.